Modern embedded systems are often based on microcontrollers (i.e. CPUs with integrated memory or peripheral interfaces), but ordinary microprocessors (using external chips for memory and peripheral interface circuits) are also common, especially in more complex systems. In either case, the processor(s) used may be types ranging from general purpose to those specialized in certain class of computations, or even custom designed for the application at hand. A common standard class of dedicated processors is the digital signal processor (DSP). A comparatively low-cost microcontroller may be programmed to fulfill the same role as a large number of separate components. Although in this context an embedded system is usually more complex than a traditional solution, most of the complexity is contained within the microcontroller itself. Very few additional components may be needed and most of the design effort is in the software. Software prototype and test can be quicker compared with the design and construction of a new circuit not using an embedded processor. Embedded systems are commonly found in consumer, industrial, automotive, medical, commercial and military applications. A new class of miniature wireless devices called motes are networked wireless sensors. Wireless sensor networking, WSN, makes use of miniaturization made possible by advanced IC design to couple full wireless subsystems to sophisticated sensors, enabling people and companies to measure a myriad of things in the physical world and act on this information through IT monitoring and control systems. These motes are completely self-contained, and will typically run off a battery source for years before the batteries need to be changed or charged. Debugging: JTAG, ISP, BDM Port, BITP, and DB9 ports. A hypervisor designed for embedded systems, is able to provide secure encapsulation for any subsystem component, so that a compromised software component cannot interfere with other subsystems, or privileged-level system software . This encapsulation keeps faults from propagating from one subsystem to another, thereby improving reliability. This may also allow a subsystem to be automatically shut down and restarted on fault detection. In the automotive sector, AUTOSAR is a standard architecture for embedded software. ^ For more details of MicroVGA see this PDF. ^ a b Michael Barr. "Embedded Systems Glossary". Neutrino Technical Library. Retrieved 2007-04-21. ^ Heath, Steve (2003). Embedded systems design. EDN series for design engineers (2 ed.). Newnes. p. 2. ISBN 978-0-7506-5546-0. An embedded system is a microprocessor based system that is built to control a function or a range of functions. ^ Michael Barr; Anthony J. Massa (2006). "Introduction". Programming embedded systems: with C and GNU development tools. O'Reilly. pp. 1–2. ISBN 978-0-596-00983-0. ^ Barr, Michael (1 August 2009). "Real men program in C". Embedded Systems Design. TechInsights (United Business Media). p. 2. Retrieved 2009-12-23. ^ Giovino, Bill. 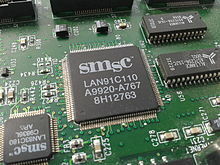 "Micro controller.com – Embedded Systems supersite". ^ "Electronic Frontier Foundation". Electronic Frontier Foundation. ^ Embedded Systems Dell OEM Solutions | Dell. Content.dell.com (2011-01-04). Retrieved on 2013-02-06. ^ C.Alippi: Intelligence for Embedded Systems. Springer, 2014, 283pp, ISBN 978-3-319-05278-6. ^ S. Mittal, "A survey of techniques for improving energy efficiency in embedded computing systems", IJCAET, 6(4), 440–459, 2014. ^ Tancreti, Matthew; Hossain, Mohammad Sajjad; Bagchi, Saurabh; Raghunathan, Vijay (2011). "Aveksha: A Hardware-software Approach for Non-intrusive Tracing and Profiling of Wireless Embedded Systems". Proceedings of the 9th ACM Conference on Embedded Networked Sensor Systems. SenSys '11. New York, NY, USA: ACM: 288–301. doi:10.1145/2070942.2070972. ISBN 9781450307185. ^ "Tektronix Shakes Up Prototyping, Embedded Instrumentation Boosts Boards to Emulator Status". Electronic Engineering Journal. 2012-10-30. Retrieved 2012-10-30. ^ Tancreti, Matthew; Sundaram, Vinaitheerthan; Bagchi, Saurabh; Eugster, Patrick (2015). "TARDIS: Software-only System-level Record and Replay in Wireless Sensor Networks". Proceedings of the 14th International Conference on Information Processing in Sensor Networks. IPSN '15. New York, NY, USA: ACM: 286–297. doi:10.1145/2737095.2737096. ISBN 9781450334754. ^ Heiser, Gernot (December 2007). "Your System is secure? Prove it!" (PDF). ;login:. 2 (6): 35–8. ^ Moratelli, C; Johann, S; Neves, M; Hessel, F (2016). "Embedded virtualization for the design of secure IoT applications". 2016 International Symposium on Rapid System Prototyping (RSP). Retrieved 2 February 2018. ^ "Working across Multiple Embedded Platforms" (PDF). clarinox. Retrieved 2010-08-17.